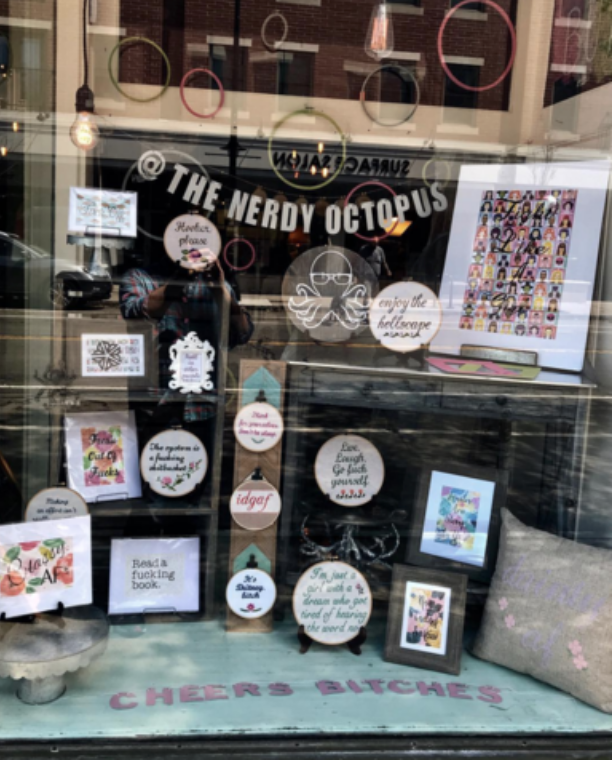 Little Button Welcomes Mike Pretty and Allison Flaherty of The Nerdy Octopus as our May 2018 Featured Artist. "All the unique handmade pieces that The Nerdy Octopus offers are formed by Alison Flaherty and Mike Pretty. We reside in Rochester, NY and after being friends for years we have decided to put our creativity and love of everything geeky, snarky and sarcastic to good use. Alison, who enjoys all things literary and Lee Pace, creates all of the cross stitch pieces. Mike, who appreciates all things comic and home decor related, devises all of the paper craft pieces, including our paper flowers." Check out instagram to see The Nerdy Octopus do a takeover in the next coming days. Visit Mike and Allison during their Featured Artist Pop Up Shop at our May 2018 Sip & Shop Event on Thursday, May 17th from 5-7pm.